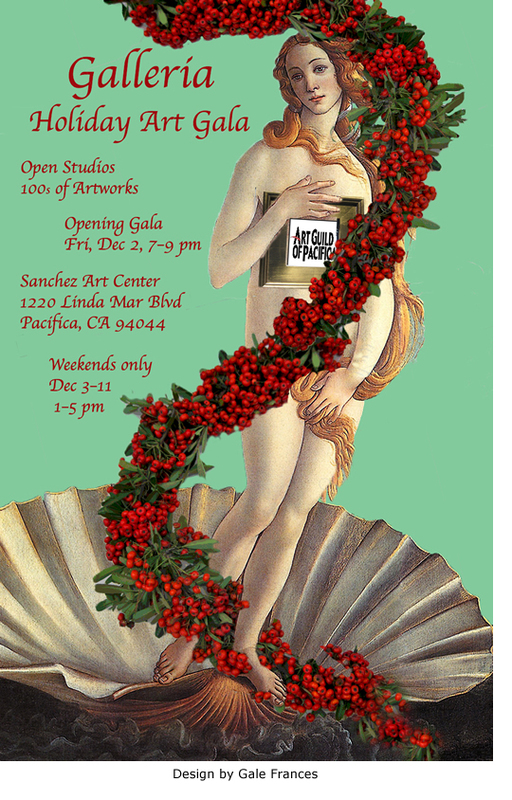 The Art Guild of Pacifica will again offer its annual holiday Galleria at Sanchez Art Center, beginning with an Opening Night Gala on Friday, Dec. 2, 7–9 pm. The Galleria is then open to visitors Saturdays and Sundays, Dec. 3-4 and Dec. 10-11, 1–5 pm. Music for the Opening Gala will be provided by Lara Garner on harp and Mark Sessler on guitar. Galleria is a wonderful venue for local artists, a place where they can participate in a salon-style group exhibition, or rent a section of wall space to create a display of their work. Galleria is the perfect place to find beautiful, affordable art and one-of-a-kind gifts for the special people in your life, in a relaxed and welcoming atmosphere. All three galleries will be filled with artwork, including small gift items such as cards, ornaments, ceramics, and artist books. You can purchase the art right off the wall. You may find some real treasures, so make Galleria your first gift-buying stop, and enjoy artful holidays. And don’t forget to gift yourself as well! The Art Guild of Pacifica’s Galleria is a fine place to spend an inspiring afternoon looking at art and talking with artists, including the Sanchez studio artists who open their studios during this time. You may even be inspired to create some holiday art for the new community art project—all ages welcome. Check for more info at facebook.com/SanchezArtCenter. Sanchez Art Center is located at 1220 Linda Mar Blvd in Pacifica, about a mile east of Highway 1. For information about the Art Guild, visit www.artguildofpacifica.org. To find out about entering your work in Galleria, visit www.ArtGuildofPacifica.org and click on Calendar.